100 Answers in 100 Days: What's Wrong With Psychic Readings? 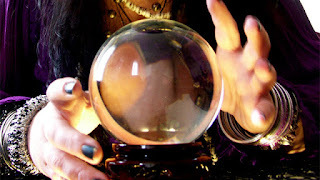 What's Wrong With Psychic Readings? Thousands of people, every day, go to a psychic or medium to have a psychic reading. These days, on the Internet, you can even get one done without leaving home. The psychic can just email it to you, or send it to your Facebook Inbox, without (supposedly) ever seeing more than your little profile pic. The question is, how do you know that they have received any kind of supernatural insight about you at all? More importantly, do you even care, or are you just ready to believe they have "the gift"? But I’m not going to attempt to debunk psychics and their readings as being fake. What I would rather like to consider is that, even if they’re true, where do they claim to receive these insights and why does that matter? Invariably the claim is that these insights are received from either the dead or from demons. But if we acknowledge ghosts and demons, then we acknowledge a Spiritual realm, and we know that there was a man who claimed to have all authority over that Spiritual realm. Jesus Christ met many people who were possessed by demons, and those same demons were subject to Him and feared Him. The Bible itself acknowledges the existence of ghosts and demons and their ability to speak to the living, and demonstrates unequivocally that Jesus Christ has authority over them, and not only when He cast them out at a single word. At the same time, He has made it possible for us to approach Him in prayer and to ask Him whatever we desire. Why would we not go to the Man whom we know is greater and who has genuine concern for our well being? There are a number of answers for why we might not do this. The first, I think, is that Jesus doesn’t give us the answer we want. In fact, Jesus will be quite silent with regard to questions regarding our future. “Will this marriage last forever?” Silence. “Will I die young?” Silence. “Will I have more children?” Silence. What’s wrong with the guy!? He doesn’t answer any of these questions! Is He even there? Does He really even exist? … Or are we asking questions that ought not to be answered? Take that first one, for example. “Will this marriage last forever?” This is the very question that my mother asked a psychic before she became a Christian. And the psychic said, “No, you will be married twice.” From that day forward my mother lived in constant fear of losing her husband. “Don’t go for that drive, you might die!”, “Don’t befriend that woman, you might have an affair!”, or she would tell herself “Don’t let him catch you not looking your best, he might lose interest in you!” She could have gone insane! But thankfully she became a Christian and realized that Christ does indeed have all authority over all things. And that whatever had been said about her future, true or not, was in God’s hands - and that He could even change what might have been. My parents are still together and in their 70’s. And even if my father were to die tomorrow and my mother remarry, the psychic is hardly vindicated since her answer (or that of her demonic source) can still be considered deceptive and destructive. Better to not have had an answer - all it led to was fear and pain. Even the true answers of the demonic sources are only designed to cause us pain. But God, for our good, keeps such knowledge from us. We are admonished, rather, to put our trust and faith in Him - trusting precisely that He knows our future, controls our future, and will be with us to the end, through the good and the bad. Another reason we might not seek Jesus is that we don’t believe the ghosts and demons are evil. Part of this association comes from film and literature. From Buffy the Vampire Slayer to all of these vampire novels which are all “just a bit of fun”, they generally all depict “the demon with a human soul” or “the demon who’s fallen in love and has changed their ways.” But this is all fiction. Of ghosts it’s easy to imagine that, since they were once people like us, they might have compassion on us from the other side and want to help the living. Perhaps you think it’s your actual grandfather who is speaking to you through the medium. Whether we believe we’re talking to a “friendly demon” or to our deceased loved ones, the truth is that what we’d like to believe may not be the reality of it, and we have no way of knowing. For every one who says “But the spirit knows secrets I only ever told grandpa”, I can imagine a scenario where an evil demon is threatening an old ghost to reveal such information “or else”. We really don’t know what’s going on behind the veil. We’re safest sticking with what we do know, and that’s that God forbade the practice of a medium. We need to trust that He had good reason to do so. After all, He sees plainly behind the veil, and we know He has our good in mind. Our faith must be in Him and not in people - living or dead. You shall be blameless before the Lord your God, for these nations, which you are about to dispossess, listen to fortune-tellers and to diviners. But as for you, the Lord your God has not allowed you to do this. The Lord your God will raise up for you a prophet like me from among you*, from your brothers - it is to him you shall listen.